We have our popular certificate presenters for ceremony, graduation, and other award recognition events. Hold up those memories that a special someone has worked hard for whether its within a corporation or an educational institution. 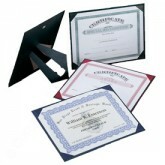 We also have certificate folios and certificate covers.